For a full head of healthy looking hair, it is necessary to combine a balanced and nutritious diet, with the right type of hair vitamins. This doesn’t mean running to the store and reaching for the first “hair and nails” vitamins though! Making an effort to get the right amount, and right type of vitamins from your diet will assure the look that we all want for many years to come. Any well balanced and healthy diet should include the proper amounts of vitamins and minerals daily. Vitamins are especially important for those suffering from hair loss, as vitamins and hair growth go hand in hand. Vitamins for hair growth sometimes can dictate how effective other means of hair growth treatment will be. A distinct type of protein composes ninety-five percent of the epidermis, and is the major part of the hairs in individuals. This protein is known as keratin. The cells of the body generate keratin by packing chains of amino acids jointly, which is why any type of diet or vitamin for the hair should contain keratin and amino acids. Often, you will see shampoo or hair treatments which contain keratin. Keratin also is important for the straightness of your hair, which is why many products which are supposed to keep your hair straight all day contain keratin. If you want to have an excellent looking head of hair, you need to practice general cleanliness as well. No number of vitamins or minerals will make-up for someone who is not keeping themselves clean. Use a gentle shampoo that consists of all-natural, non-harmful components to get the best results. Harmful substancespassthrough the skin's numerous levels, poisoning your cells and hair follicles. It is important to think of your skin as an organ, such as your internal organs. You surely don’t want to pour chemicals on your internal organs, and you don’t want on your external organs as well! Your scalp is made up of millions of living cells. These cells need oxygen and nutrients, which are provided by regular and constant blood flow to the scalp. Vitamins for hair loss, such as biotin and niacin, are transported by the blood to the scalp. If you are using chemically laced shampoo, your scalp will not receive or absorb enough nutrients. It is vital that you treat your hair with natural and organic products only. Biotin is one of the most well-known vitamins necessary for hair growth, which is why you will see loads of biotin in any hair, skin, or nails product. However, biotin is much more readily absorbed when you obtain it through natural foods such as eggs, almonds, or whole grains. If you are eating a vegetarian or vegan diet, you will probably get loads of biotin in your diet regardless! One of the main benefits of continuously eating a diet which is high in vitamins and minerals is you will never need to waste your money on expensive, and worthless supplements. Natural foods beat supplements, every time. There are many different techniques for treating your hair, but the absolute best way is to intake aa natural diet high in vitamins and minerals, and treating your hair with organic and chemical free products. If you want to learn more about how to treat your hair and skin so it maintains health and longevity all the time, I highly suggest you check out www.AnnaTargoniy.com! 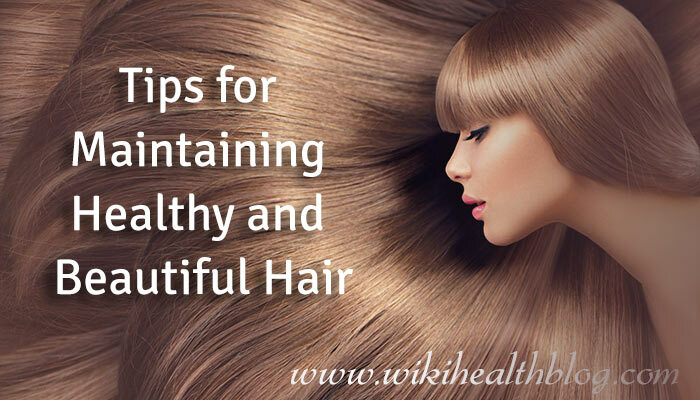 It is not extremely difficult to maintain your hair health, even as you get older. People who drink copious amounts of alcohol or smoke cigarettes will have a much more challenging time, which is why living a healthy lifestyle overall is the best answer to any hair issues. If you use these tips I promise that you will not have a tough time maintaining your hair!